The Grey Squirrels of Highbury have adapted to climbing drainpipes, guttering and roofs, equipped as they are with back paws that rotate up to 180 degrees. They are fearless, leaping through the trees. Sometimes they miss a branch & fall to the ground, springing back up straightaway. They must be made of solid muscle. 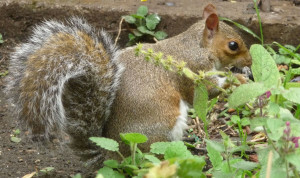 They dig in bare earth, burying seeds and nuts. 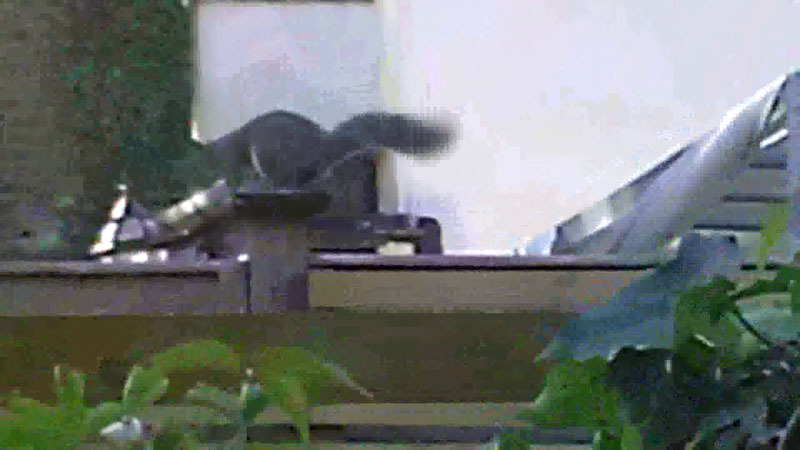 RF put shiny decorative stones in his pots, covering the surfaces to discourage squirrels. 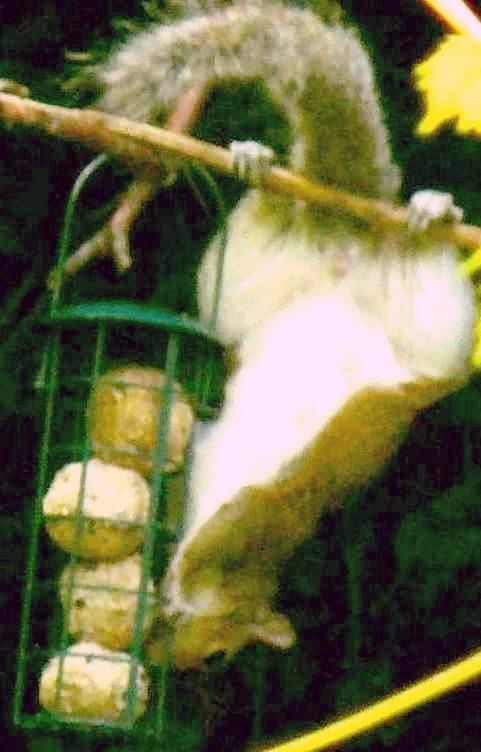 Some of our feeders have metal cage ‘squirrel guardians’ to deter them. 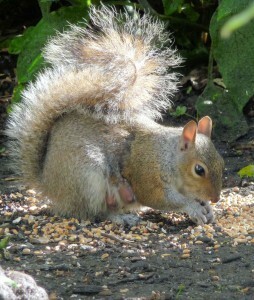 Grey Squirrels eat nuts (especially acorns, beechnuts & chestnuts) & other seeds. Also buds, flowers fruits, fungi & some insects. 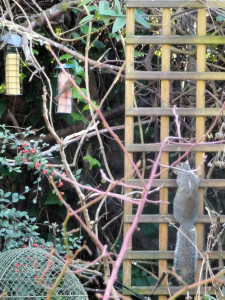 In our garden they like peanuts (monkey nuts), sunflower seeds & suet, & enjoy demolishing avocado stones whenever they find them. RF planted sunflower seeds. The squirrels watched and waited… a seed sprouted, its stem grew tall & a flower appeared at the top… seeds formed in the centre and ripened. 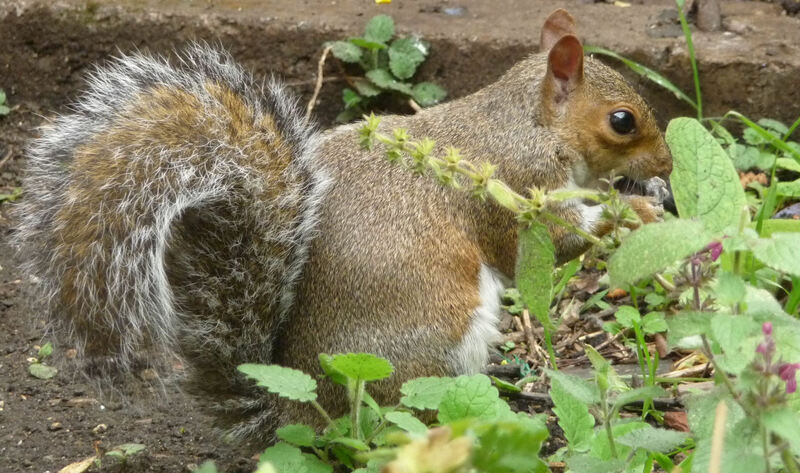 One day a squirrel took on lumberjack duties, gnawing at the base of the sunflower’s stem until… timber! It toppled over. 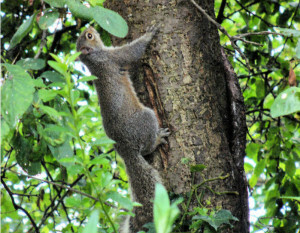 Scampering to the other end of the stem, the squirrel flexed its jaws. Bite! Bite! The flower was severed from its stem & dragged onto our low brick wall. All we later found was a seedless sunflower and a pile of sunflower shells. One day two squirrels came into the garden with their heads covered in some sort of white gunge. 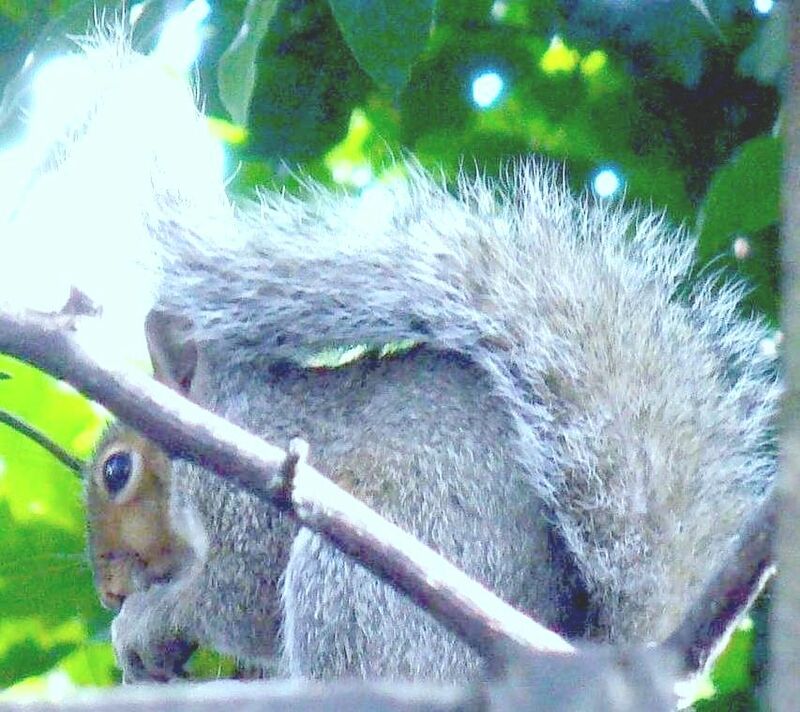 In a 2013 Springwatch, a viewer’s video showed a mother squirrel leaping from roof guttering with her young one grasped tightly to her. Something similar may have happened here. Building work is ongoing in this neighbourhood. 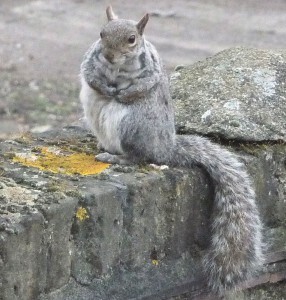 One very senior squirrel, with shapely curves and a fine bushy tail (papa? mama?) 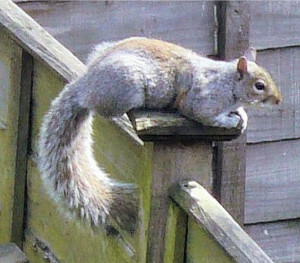 and one thin-tailed teen squirrel may have plunged from a roof together and landed in a pail of… whitewash? Plaster? Or it may have been a chase that went horribly wrong. They managed to remove the stuff, but it took over a week to do it. On non-Matchdays, Highbury was often empty but for its groundskeeping crew and the local Chief Crow, who liked to blast out his caws from the North Bank’s roof struts. This day was a Matchday. 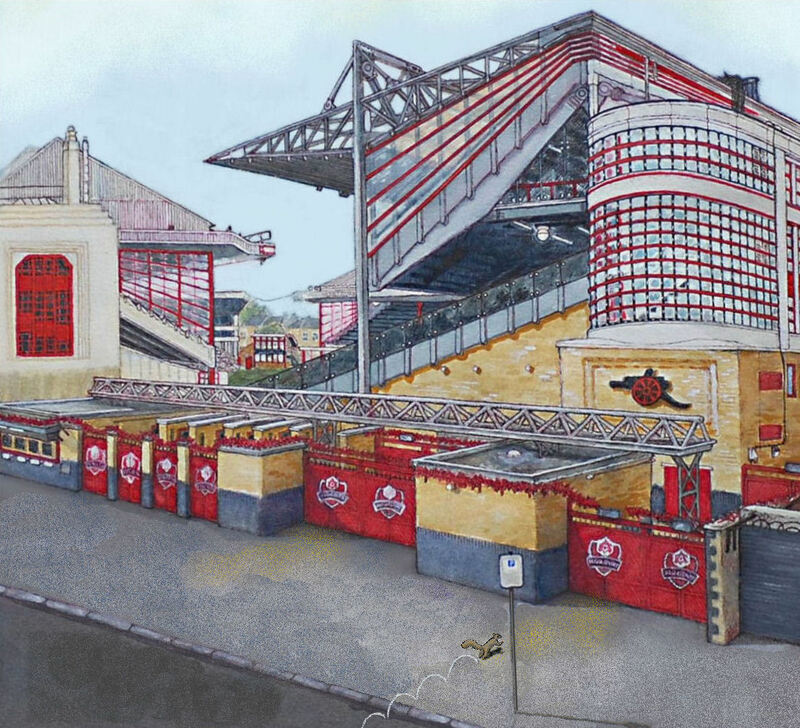 The grand old stadium was in the last throes of its life. A larger stadium, built nearby to replace it, was now ready for the new season. Highbury was to be pulled down and replaced with flats. Its last ever night game, the first leg of a Champions League semi-final, Arsenal v Spain’s Villareal, was set for that night, with kickoff at 7.45pm. The hours went by. The usual sell-out crowd and a host of camera crews and press photographers packed into Highbury and the game began. 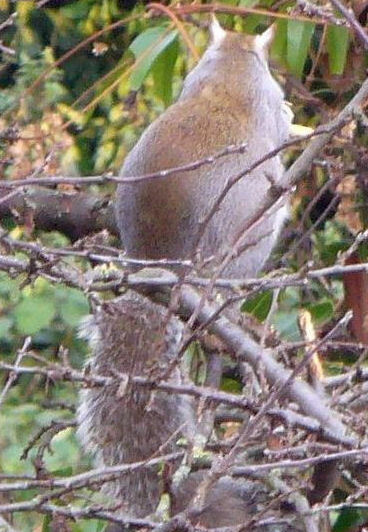 Ten minutes had gone by and it was nil-nil, when a squirrel jumped over the advertising hoardings onto the pitch and joined the game. But the game went on. 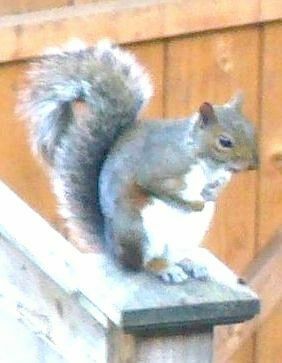 Fans spotted the invader and chanted ‘Squirrel! 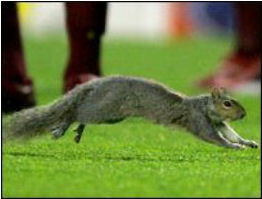 Squirrel!’ as it ran down the pitch, blocking Diego Forlan. 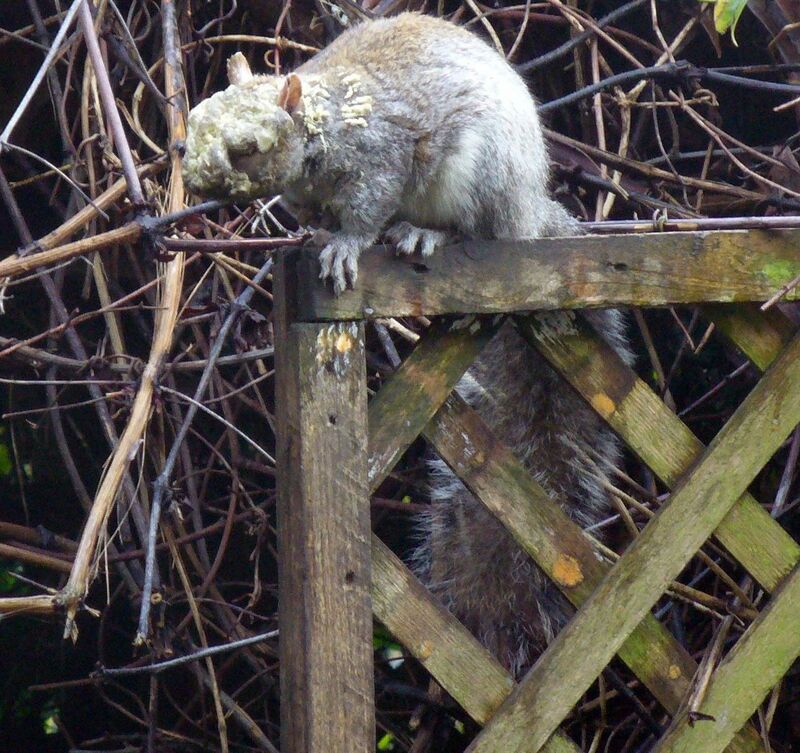 It raced over to Jens Lehmann’s goal to guard the post. 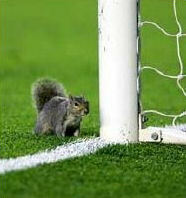 Finally, after 8 minutes of squirrel-on-pitch action, the referee stopped the game. The rodent left the grounds under its own steam; some said it crossed the street and got into Gillespie Park. Arsenal won the game 1-0. That night internet chatrooms buzzed with squirrel tales. Names for the squirrel were suggested: Tufty, Nutkins, Squirrelinho… The rodent turned up on youtube. 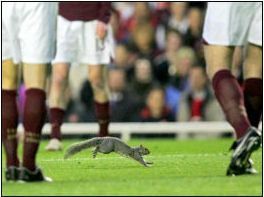 Next day every newspaper’s sports section had news of the pitch invasion: ‘Arsenal fans go nuts over latest signing’…‘ The Squirrel Nutmeg’…’12th player at Highbury as Arsenal win first leg of Euro semi-final‘… ‘Tufty the Squirrel thought he was going to watch Nuts County…’ Sports journalists rated the squirrel’s footballing abilities, along with players for Arsenal & Villareal. Manager Arsene Wenger was quoted, saying ‘he was a good dribbler’. Images of the squirrel also made the papers’ front pages. 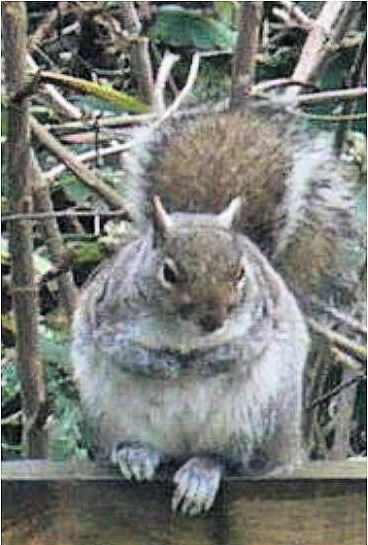 The Evening Standard had two photos on its cover: one was of the Queen, celebrating her 80th birthday; the other was of the Highbury Squirrel. 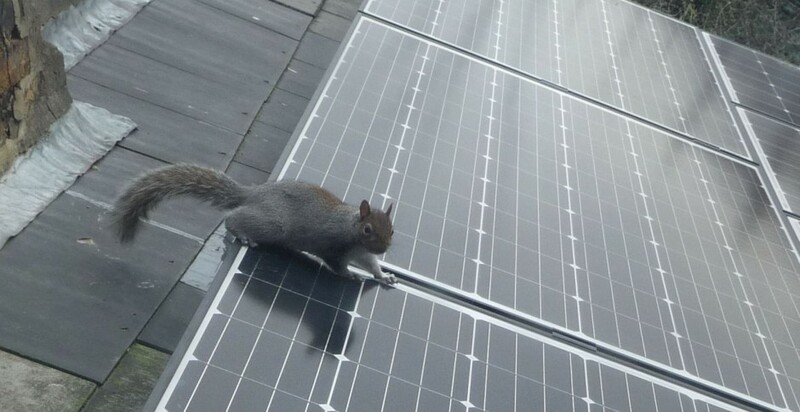 On the day after the semi-final, a press photographer came to Gillespie Park’s Ecology Centre, hoping for candid shots of the now famous H. Squirrel relaxing at home. 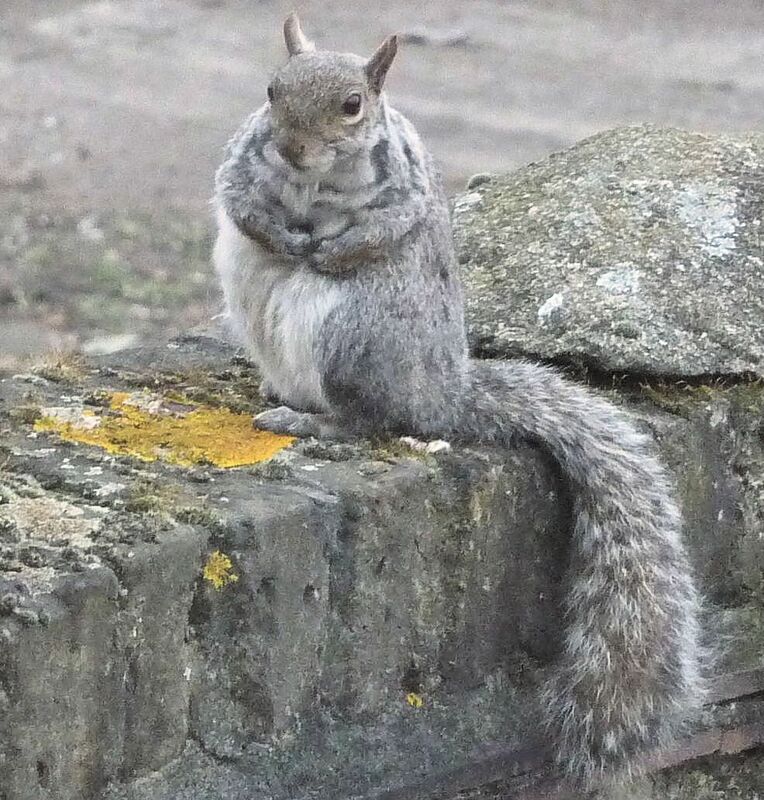 He was taken round, but not a single squirrel showed itself. Keeper Jens Lehmann appeared at the next Arsenal press conference. Asked about the 12th player who’d helped defend his goal against Villareal, he reminded everyone about the World Cup, to be staged in Germany that summer. 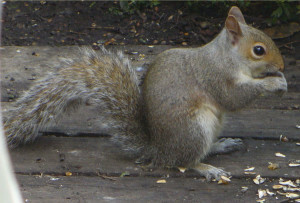 ‘We have many squirrels. 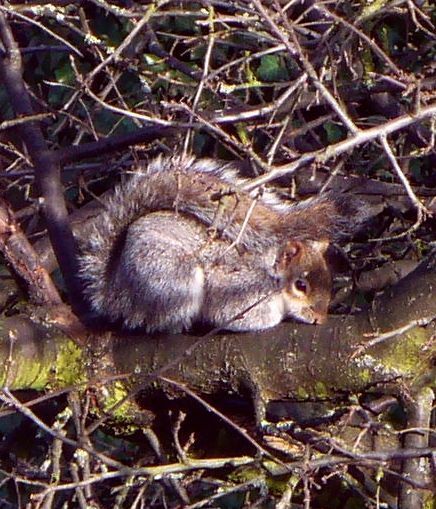 Brown squirrels…’ he grinned. An obvious drawing card. The next Premiership game at Highbury was with old rivals Tottenham. Even the broadcasters were intensively searched before going into the stadium. ‘Just checking for squirrels’, said a steward… The legend lives on.